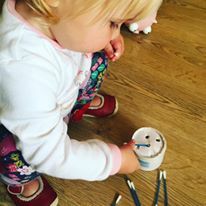 You may be filled with dread at the thought of doing any play ideas which involve paint and glue. On a day off from work with little time to fit everything in it is not always my idea of fun. That’s why I am keen to share some ideas for quick play. Honestly all of these activities took me minutes to throw together but can keep a young child amused for ages. 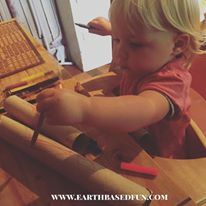 You don’t need to be artistic to create quick play ideas, or have a lot of time on your hands, just some imagination and whatever you have knocking about the house or garden can easily be made into something fun and entertaining. What would we do without left over kitchen and toilet rolls?! 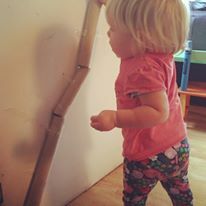 Make a tube and stick on a wall or door and use whatever you have handy to pop down the tunnels. We used pasta but pom pom balls or even conkers in the autumn work well. An old pot with holes and some cotton wool buds. 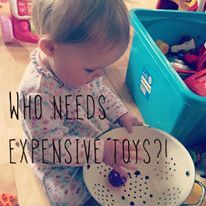 Great for eye and hand coordination and you could put colours on them for colour coordination. I used the same rolls from the tunnel we made and decorated and made into a necklace of sorts. 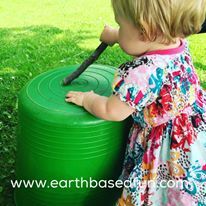 A selection of very basic play, for babies or young children. 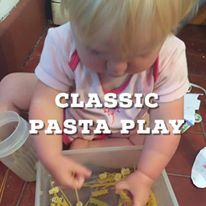 Pasta play, drumming on anything and everything, and colander play with toys or straws. Let me know your quick play ideas, share any ideas in the comments, I would love to see or hear about them. 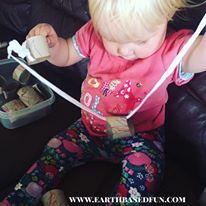 Some brilliant ideas! I accidentally dropped a pot of cocktail sticks on the floor the other day. My two year old loved putting them all back in again. Saved me a job and kept her occupied. Bingo!